The Soul has received a light update to its exterior and interior design, and is now available with new safety and infotainment technologies. The upgraded Soul and Soul 1.6 T-GDI will be available in the UK from late 2016 and will have its public unveiling at the 2016 Paris Motor Show (Mondial de l’Automobile) on 29 September. 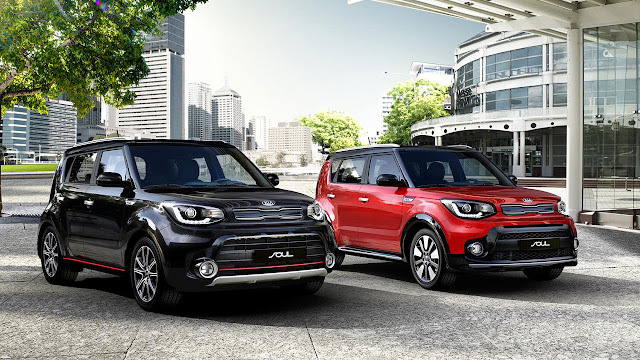 Powered by Kia’s 201 bhp 1.6-litre T-GDI (turbo gasoline direct injection) engine from the cee’d GT and pro_cee’d GT, the new Soul 1.6 T-GDI is the most powerful Soul that Kia has produced. With the new engine, the car will accelerate from 0-to-60 mph in 7.5 seconds, with a top speed of 122 mph and produce CO2 emissions of 156 g/km. The Soul 1.6 T-GDI is available with larger brakes than the standard Soul. The car is fitted with 17” ventilated front discs, the solid rear discs remain the same size. The revised brakes reduce the stopping distance of the Turbo model slightly, to 35.3 metres when stopping from 60 mph (down from 35.5 metres), with the changes primarily made to ensure fade-free braking power under consistent use. These include updates to its exterior appearance, with remodelled front and rear bumpers with a metallic skid plate for a more robust appearance. 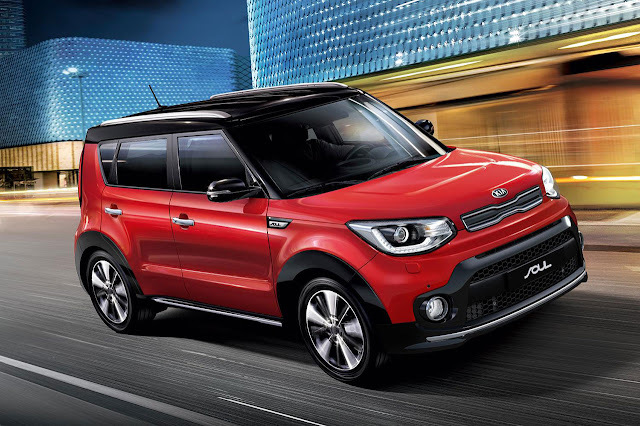 The Soul’s front bumper houses optional bi-function HID (high-intensity discharge) headlights with LED daytime running lights, and an updated finish to Kia’s signature ‘tiger-nose’ grille. The rear of the car features newly-designed fog lamps and reflectors for greater illumination for following road users. The ambience of the cabin has also been enhanced with the introduction of new gloss black and metallic highlights and switchgear. In addition, new exterior features emphasise the car’s compact SUV credential with a gloss black finish to front and rear wheel arches, and a body kit for front and rear bumpers and side sills on selected models. New technologies will further enhance the appeal of the Soul, with buyers able to choose from Kia’s latest 5.0-, 7.0- or 8.0-inch colour touchscreen infotainment HMI (human-machine interface). The new HMI systems provide smartphone-style touchscreen control over the audio-visual navigation system, and is available with Apple CarPlay™ (for iPhone 5 or newer) and Android Auto™ (for Android 5.0 Lollipop or newer) for full smartphone integration. The new HMI systems also house a rear-view parking camera, and a new USB port has been added to the rear of the cabin, allowing back-seat passengers to charge mobile devices on the move. The front passenger seat is also now available with eight-way power adjustment, and drivers can benefit from new rain-sensing windscreen wipers and, in models equipped with 7DCT, the new Drive Mode Selector. The upgraded Kia Soul and the new Soul 1.6 T-GDIwill be available from Kia’s UK dealer network in late 2016 following its unveiling in Paris. Full UK specification and pricing will be released at launch.